Quilts and Pieces: I must be Nuts!!!!! OK, so I thought those blocks I shared in the last post were tiny - ha - not so! At my small quilt group that meets Monday nights decided a few weeks ago that we LOVED this mini quilt that was in a book one of the gals just bought. So we decided to each make one in our own style of fabric/colors! Kind of a challenge, but fun project to do. Well.... I didn't really look at the sizes too closely until this weekend when I went to cut out the pieces to sew Monday night! YIKES! But I did it! This block will finish to be 3-1/4" square. I didn't do too bad, only that one little pucker and the more I tried to redo it the more it got stretched so I finally just left it. I think when it gets with the other blocks and quilted it won't be so noticeable. So I have 1 of 12 blocks done! I'm doing 1800's repro's. One lady is doing 30's and another batiks with a black background. Another is thinking of using just her stash (which I am doing too!) but enlarging the blocks, and the 5th hasn't decided yet. So this is really fun. I'll share pics next month when I see what kind of progress they've made. And I thought Dear Jane blocks were bad! On another note my sister who lives out east sent me some really cool pictures from the ice storm they had last week. I"ve just been too busy to really write much lately so I'm finally getting to it! Anyway, look in the above picture - can you see the bird! The first thing I asked is - "Please don't tell me the bird was iced over"! She said she didn't even know the bird was in the picture when she took it - she saw it after she downloaded the pictures! But she did go out to check and yes the bird has flown away - wheh! And notice in this picture the nest at the top of the tree. The wind and the ice bent the tree limb over so much the nest is now sideways instead of facing up. And she took a closeup of a tree to show how much ice they had! And on topic #3 - Baked Oatmeal! MMMMM, it is soooo good. Very sweet you don't even need to sweeten it - although we put fresh strawberries on it and that was really good! I had a few ask for the recipe so here it is! Enjoy! 1. Beat oil, sugar & eggs together. 3. Put into greased 9 x 13 baking pan and bake at 350 for about 20-25 minutes. (Or you can cut it in half and put in an 8 x 8 pan and bake about 15-20 mins). p.s. where can I get the pattern? That is just an awesome block. I think doing those tiny blocks is just so much fun. It's a real challenge to see if we can really do it. Do you know the book that the block is in? I'd love to try it. Thanks so much for the recipe. Can't wait to try it. Wow - what a great block! I've never attempted anything that small before - I think I'd end up with no hair or a lot more gray ones if were to try that out. I'll be watching your progress. What amazing photo's of the ice storm - so pretty and yet it caused so much hardship for so many people. What a tiny tiny block! I have trouble with 2" pieces so you are doing a marvelous job. Love your blog. Someone needs to make sure you have really cute bows on your straight jacket - you must be nuts. LOL Cute block, though! 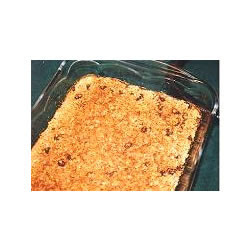 The Baked Oatmeal sounds yummy - must try it very soon! Yep, you are. But, hey, life would be SO boring if we weren't! That block is just amazing! I get panic stricken just imagining working on something so small!! I do admire it though. Love those ice photos, amazing. Wow, those ice pictures are really something. We didn't get hit that bad this winter, luckily! Your new project does look like it would be a bit tough, but it sure is pretty. Have you been bitten by the miniature fly?! The white and red and the repro blocks look so awesome. Your sister made wonderful pictures. Thanks for sharing. My eyes hurt just thinking about piecing a block that tiny...but I love them! Thanks for the recipe...it is going to be cold and rainy this weekend so this may be Sunday breakfast! I love those tiny blocks. Are you going to do a whole quilt? Dawn you obviously love challenges! How on earth did you do that tiny weeny piecing? Love the ice storm photos - good thing that bird was okay! That red and white and blocks is tiny. And you did it with a sewing machine? I'm extremely impressed. The ice pictures are cool. I hope there wasn't a lot of damage from it though. That is a LOT of ice! We get ice storms like that here when an arctic cold front moves down inland east of our mountains and a freezing east wind blows down the Columbia River gorge and meets a warm air mass full of rain coming in from the Pacific ocean. If you've never seen an ice storm you can't imagine what it's like. Falling rain, looking perfectly normal, that freezes to ice the moment it hits the earth. We've had as much as 6" solid ice on our roads, and parts of Portland without electricity for almost two weeks. The little blocks are incredible. What is the name of the book? I'd really like to take a look at it. Never had baked oatmeal - sounds interesting! Wheee! I am not letting our mini group teacher look at these...yet!